Features a 2 mp rear and 0.3 mp front camera, 1080p glasses-free 3D playback with HDMI-Out, and 5500 mAh battery. 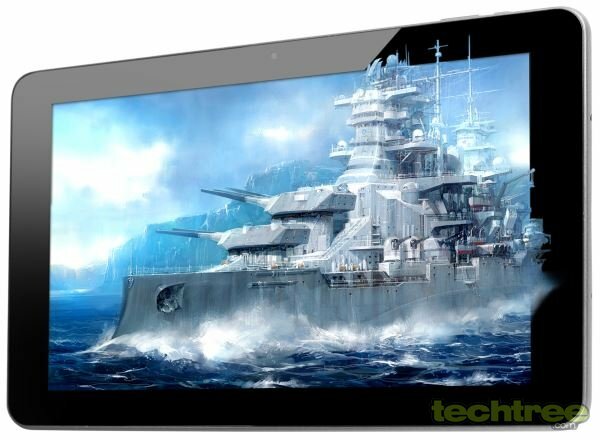 10.1" multi-touch capacitive screen with pixel dimensions of 1280x752 and glasses-free 3D. 1.2 GHz Coretx-A8 CPU, 1 GB RAM. Wi-Fi 802.11 b/g, 3G via external dongle. HDMI-Out with Full HD (1080p) 3D output, USB 2.0 port, gyroscope. 8 GB internal storage, 32 GB microSD slot. 5500 mAh battery with up to 6 hours of backup. 8" (l) x 5.4" (w) x 0.6" (15 mm) (d), 600 grammes, Colour: Black. Package includes: HDMI cable, Wireless headphone, LAN to USB cable, and memory card reader. The press release claims that the gadget is not just capable of playing 1080p (Full HD) video, but can also display 3D content on its screen using glasses-free technology. This can further be be displayed on a 3D TV via its HDMI-Out port. However, there is no mention of anything related to 3D on the product page, which is probably a huge oversight on the manufacturer's part. USB OTG (On-The-Go) functionality is also present, allowing you to connect various peripherals, including storage drives and input devices. On the software front, the tablet supports the Google Play store, giving access to a host of applications and games. A converter app has been provided to convert any video into 3D. To give the tablet an "educational" spin, Wishtel has included over 1000 hours of video content and course material for engineering, IIT–JEE (12 and 24 months), medical AIPMT, CAT, GMAT exams, and the school curriculum for CBSE, ICSE, and all state boards at a special subscription cost. The Wishtel IRA Comet is available for Rs 10,000, which is a good price for the features it offers. While cheap tablets with 3D screens already exist, such as the 7" ICE Xtreme, this is likely to be the first 10.1" 3D tablet in India. Samsung has also recently launched its 10.1" GALAXY Note 800, but it is a top-of-the-line tablet that's priced a lot heftier at Rs 39,000. If 3D is not your cup of tea, but you're still looking for a budget tablet with a big screen, take a gander at the 10.1" Micromax Funbook Pro that's also priced at Rs 10,000. Check out the image gallery below for a few more product shots.